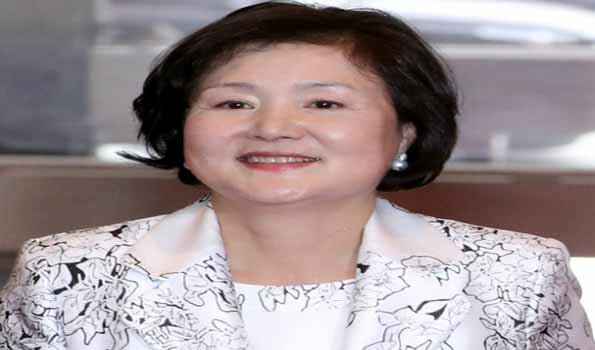 Lucknow: Republic Of Korea's first lady Kim Jung-Sook would be on a three days visit to Uttar Pradesh from November 5 where she will attend the Diwali celebrations in Ayodhya and lay the foundation of a memorial of Korean Queen Hur Hwanq-ok. In Ayodhya , UP government is holding a three days Deepotsava programme from November 4 to be attend by UP governor Ram Naik, chief minister Yogi Adityanath and other dignitaries. But the main attraction in this three-day Diwali celebrations will be the presence of First Lady of South Korea Kim Jung-sook, the wife of South Korean president Moon Jae-in. She will attend the programme on the last day on November 6, when the 3 lakh earthen lamps would be lightened.According to official sources here on Friday, Ms Kim Jung-Sook would reach Amausi airport in the evening of November 5 by a special aircraft. In the night, Chief Minister Yogi Adityanath will hold a dinner on her honour which will be attended by the state ministers and other dignitaries.On November 6, the Korean first lady will leave for Ayodhya at 1230 hours by road from the hotel where she would be staying along with a delegation. After attending the Deepotsava progame on the banks of river Saryu in Ayodhya and lay the foundation laying ceremony for the Rs 50-crore memorial of Queen Hur Hwang-ok, also known as Suriratna, a princess of Ayodhya who went to South Korea and married the king.She would return back to Lucknow on the same night at around 2130 hours by road.